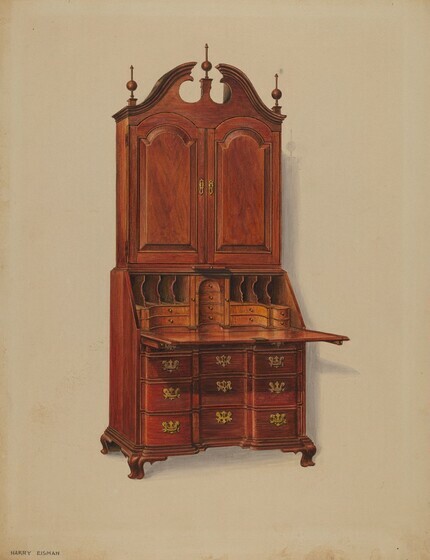 This program illustrates the major styles of fine American furniture from about 1650 to about 1850. 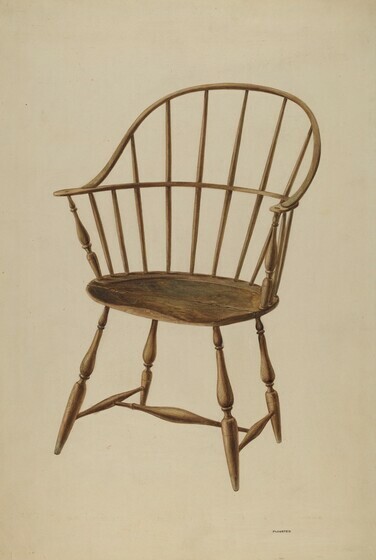 During this time, American furniture styles followed English fashions, though there was often a time lag between design developments in English and their appearance in America. In general, American furniture differed from English prototypes in that American furniture was simpler in both form and decoration. Furniture in the Jacobean style was made in America from about 1640 to about 1690. Pieces such as this chest were the work of the joiner, or carpenter, for cabinetmaking had not yet evolved as a specialty. Simple rectangular construction was the rule. During the seventeenth century, drawers were added to the box form of early chests, and the form evolved gradually into the chest of drawers as we know it today. Chest fronts were often divided into panels that were architectural in character. Frequently the panels were carved in shallow foliate designs, as seen on this late seventeenth-century oak chest. In addition to carving them, the seventeenth-century craftsman embellished his products with turning, that is, with bulbous shapes turned on a lathe. Turnings, split in half and painted black, were frequently applied between carved panels on chests, as has been done here. 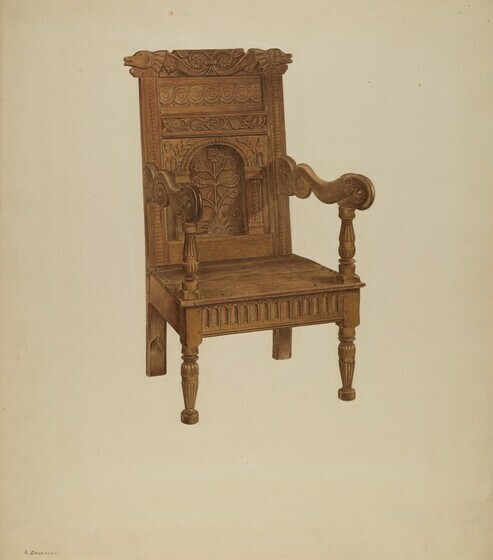 The wainscot chair was the fine chair of the Jacobean period. This one is made of oak, a wood commonly used in the seventeenth century. The paneled back of the chair is similar to panels on chests and cupboards of the same period. This aspect of Jacobean style is derived from wainscoting, the wooden paneling used in Elizabethan rooms. The arched niche cut into the center of the seat back and repeated in the carved arcades of the seat rail is another decorative motif adapted from an architectural form. Notice the turned bulbous shape of the front legs and the arm posts, which are a characteristic feature of Jacobean furniture. 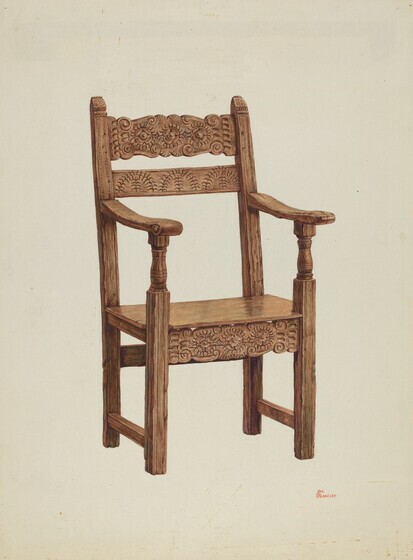 Open chairs were more widely used in America than the solid wainscot chair. Carver and Brewster chairs, named after seventeenth-century Massachusetts governors, were two popular types of open-back chairs. 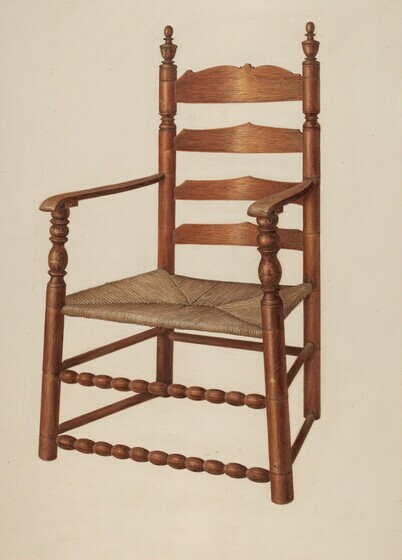 The Carver armchair, seen here, has a characteristic seat back consisting of a single row of three turned spindles set between horizontal cross rails. The Brewster chair was more complicated, having tiers of turned spindles on the back, and, frequently, under the seat rails as well. Slat-back chairs were popular in American houses during both the eighteenth and nineteenth centuries. The horizontal curved back splats were more comfortable than the rigidly vertical spindles of Carver and Brewster chairs. Slat-back chairs display turned construction except for the slats, which were carved as solid curved forms set between turned uprights to form the seat back. The shape of the slat often distinguishes the region in which the chair was made. New England slats were generally cut straight on the lower edge and curved or shaped on the upper, as in this example. 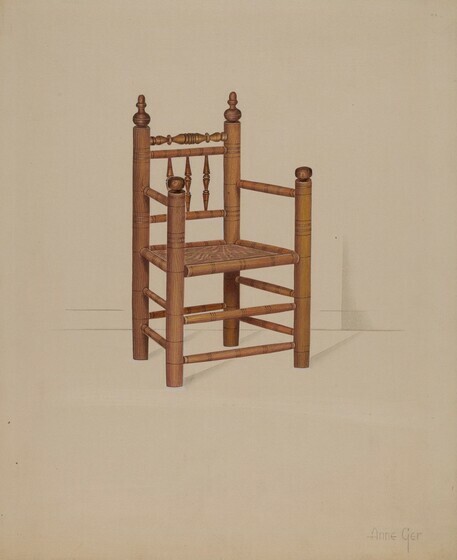 Although the development of American Windsor chairs postdates the Jacobean period, Windsor construction, like the early furniture, relies upon the use of spindles. Because the spindles of the seat back usually fan out from a curved seat, seating space is ample and comfortable. This may account for the continuing use of Windsor chairs throughout the eighteenth and nineteenth centuries. Windsor chairs originated in England, but American craftsmen developed a wide variety of types that left the English models far behind. 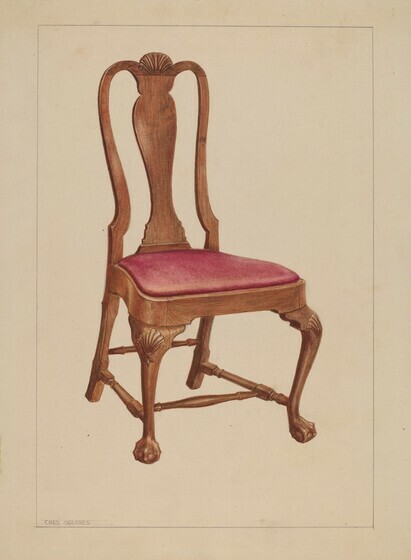 Windsor chairs are named according to the style of their back; here is a hoop-back armchair, so-called because of its broadly curving back rail, which has been bent downward to meet the arms. The boldly splayed or angled legs and the delicate spindles set off the generous proportions and sweeping arcs of this chair. The trestle table, which is described in mid-seventeenth-century inventories as a "table board and frame," is the oldest form of American table. 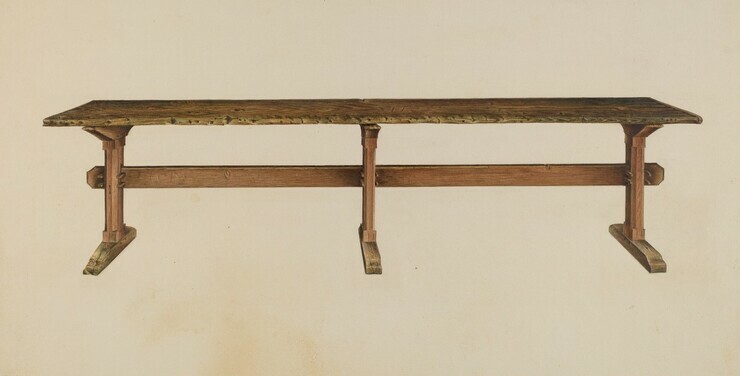 In this New England example, the "table board" is a single plank of pine two feet wide and over twelve feet in length. The long, narrow plank rests on a frame consisting of three oak trestles. The trestles are held in position by a pine brace that passes through them and is pegged into place. 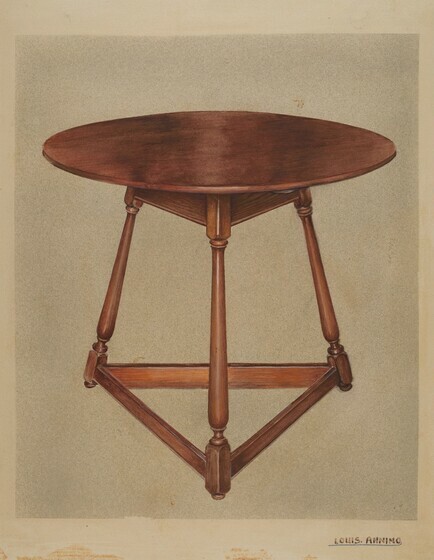 In colonial days, gateleg dropleaf tables were popular because they saved space. American gateleg tables followed early seventeenth-century English prototypes. They always had two swinging legs to support the hinged dropleaf ends, yet the shape of the tabletop varied. This table has an oval top, but square, round, and rectangular tops were also common. The wood used for this example is walnut, a finer wood than the oak that was predominant earlier. In the use of walnut, this table can be considered a departure from the traditions of the Jacobian style—it heralds the approach of the William and Mary style in eighteenth-century America. The Index data sheet indicates that the piece belonged to a family in Lewes, Delaware, and that it dates from about 1680, but it may have been made slightly later. At the end of the seventeenth century and in the early part of the eighteenth century, the newly affluent colonists created a demand for finely crafted furniture. American cabinetmakers responded through the use of richer woods and by modifying the earlier Jacobean forms in order to achieve the lighter, more graceful designs preferred by fashionable patrons. The taste of the well-to-do colonists and the products of American craftsmen reflected the influence of new fashions in English furniture design. English cabinetry began to take on some of the elegance of French styles as a result of the work of Continental craftsmen who came to England in the late seventeenth century. A style called William and Mary after the reigning English monarchs thus evolved in England after 1660 and was adopted by American cabinetmakers at the end of the century. Although Jacobean decorative techniques such as turning and carving were retained in furniture design, proportions were refined, curves and angles added, and structural members made slimmer. This pine and walnut table with a circular top and three finely turned legs splayed outward at a vigorous angle is a popular William and Mary form. The angle of the legs and the curve of the round table avoid the heaviness of the earlier Jacobean square forms. The bulbous uprights of Jacobean furniture have given way to slim and varied turnings. The total effect is one of lightness and refinement. 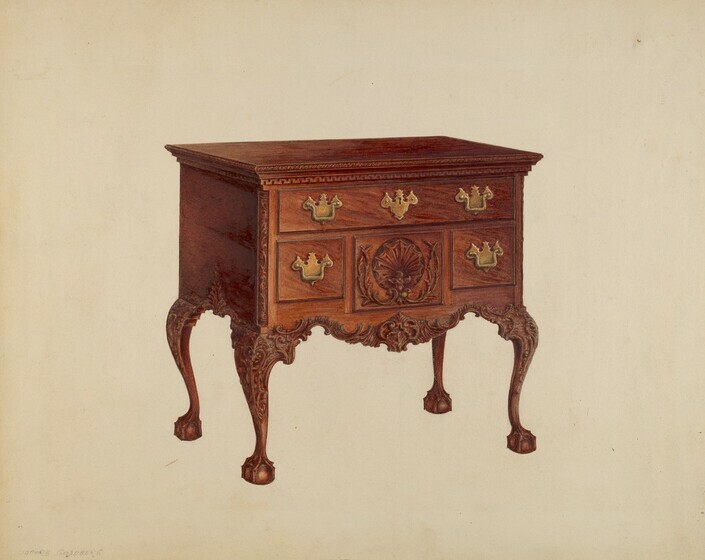 A popular new furniture form of the William and Mary period was a chest raised on a stand. Notice the feeling of lightness achieved as the chest portion is raised high off the floor. It rests on an elaborately and finely shaped frame. 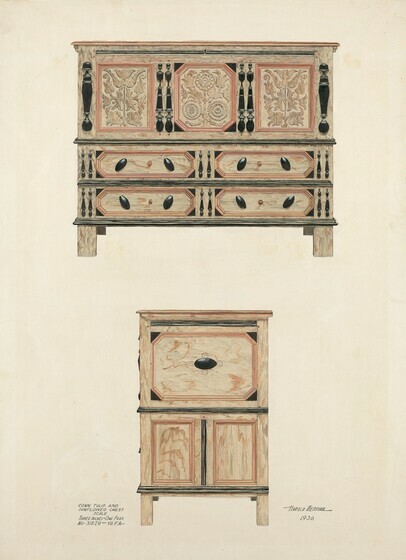 The design, modeled after Oriental cabinets on stands, is enhanced by richly painted surface decoration. The ornament imitates that of Oriental lacquered furniture, which, during the eighteenth century, was being imported into Europe by the Dutch East India Company. European taste for the luxurious and exotic wares of the Orient was echoed in America; craftsmen tried to duplicate the appearance of Oriental lacquered decoration through the use of varnishes, gilt, and polychrome paints in a technique known as "Japanning." As the popular William and Mary forms were refined to meet new demands for elegant furniture, another style evolved, named after Queen Anne, who ruled England from 1702 to 1714. American Queen Anne furniture was produced from the 1720s until about 1750 and is characterized by delicate lines, slender proportions, graceful S-curves, and handsomely carved woods. Walnut was the favored wood, but mahogany imported from the West Indies, native American cherry, and maple were also used. Jappaning continued to be popular, but natural wood, richly figured and carved, was extremely fashionable. 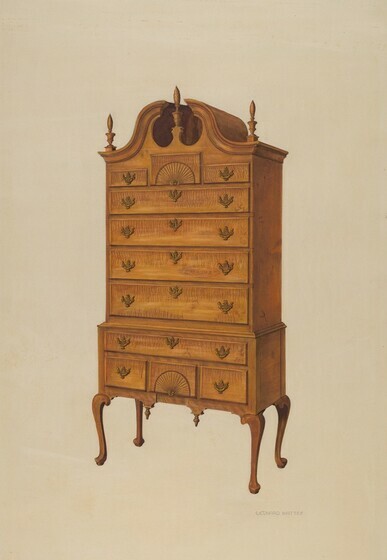 During the Queen Anne period in America, the highboy attained its characteristic form. This highboy, made of curly maple, is surmounted by a scrolled pediment with a broken arch, called a bonnet top, a consistent feature of the highboy form. Three finials, vigorously carved in a flame design, echo the sweeping curves of the bonnet. The natural decorative quality of the figured wood is complemented by restrained shell carving on the middle drawers at both top and bottom of the case. The high chest stands on cabriole legs, that is, legs with broad outcurving knees tapering to slim incurved ankles, which spread into a pad foot. The cabriole leg was a distinctive feature developed in the Queen Anne period; its shape repeats the S-curve that dominated all Queen Anne design. Mirror glass became available to the colonists after 1673, when the English began producing it. For the next century, English mirror glass was used by American cabinetmakers. At first it was made in small sheets, but gradually, the size was increased. Frames were enlarged to accommodate larger mirror panels, and their design became more elaborate. The preference for slim forms exhibited in other Queen Anne furniture can be observed in the mirrors of the period. 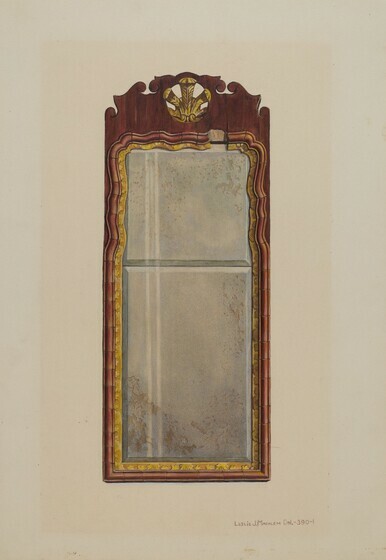 Typically, a long narrow frame contains two panels of glass, as in this tall mirror, which bears on its back the inscription "Trimbell, 1747, Phila." An elegant effect is achieved through the contrast of the rich wood tones of the frame with the carved gold-leaf inner border and gilded medallion. The characteristic Queen Anne S-curve is seen in the carved scrolls that give the crest its ornamental silhouette. Queen Anne chairs are characterized by graceful curving lines. A distinctive feature is the solid back splat, shaped like a vase or violin. The splat in this chair rises from the seat to the center of the curving top rail, where it ends in n a carved shell. The front legs have the cabriole shape and are ornamented with carved shells at the knee; the back legs are plain and round—a common feature. The uprights of the seat back follow a gentle S-curve, bending inward at the base and outward toward the top. The curve of the top continues from the central shell into the curve of the uprights. Unlike typical Queen Anne furniture, this chair has the ball and claw feet which were a hallmark of later eighteenth-century pieces; their presence here marks a transition to the Chippendale style which was popular in America after 1750. The Chippendale style is an ornate variation of Queen Anne designs. The style is named for an English cabinetmaker, Thomas Chippendale, whose volumes of plates and text, The Gentleman and Cabinet-Maker's Director, were published in London in 1754 and reissued in several editions. These books were used by cabinetmakers in England and America and were the source for the designs of furniture produced between about 1750 and 1775. Chippendale chairs are of generous proportions and have certain common features. Top rails usually follow the "cupid's bow" curvature, with the two ends, or "ears," curved upward, as in this example. Unlike the plain back splats of the Queen Anne period, those of the Chippendale style were carved in an openwork design. Back splats were made in a great variety of patterns; many were very elaborately interwoven and followed Thomas Chippendale's original designs faithfully. Chippendale chairs may have front legs in either of two types: straight legs, reflecting the taste for design elements in the Chinese style, or, as in this chair, well-shaped cabriole legs terminating in boldly carved claw and ball feet. As the colonists' standard of living became more luxurious, specialized furniture forms were developed. The habit of drinking tea became popular in the 1730s, and tea tables became an important eighteenth-century furniture form after 1740. 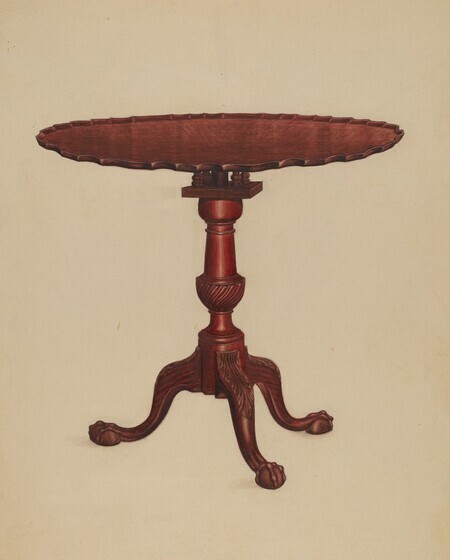 During the Chippendale period, cabinetmakers developed a tripod base tea table with its top supported by a birdcage device of the kind that appears here. The "birdcage" apparatus was ornamental as well as functional; it permitted the top to revolve when the table was in use for serving, but a peg inserted through the center prevented the top from spinning wildly. This characteristic Chippendale tea table stands on three boldly outthrust cabriole legs carved at the knee and ending with the usual ball and claw foot. 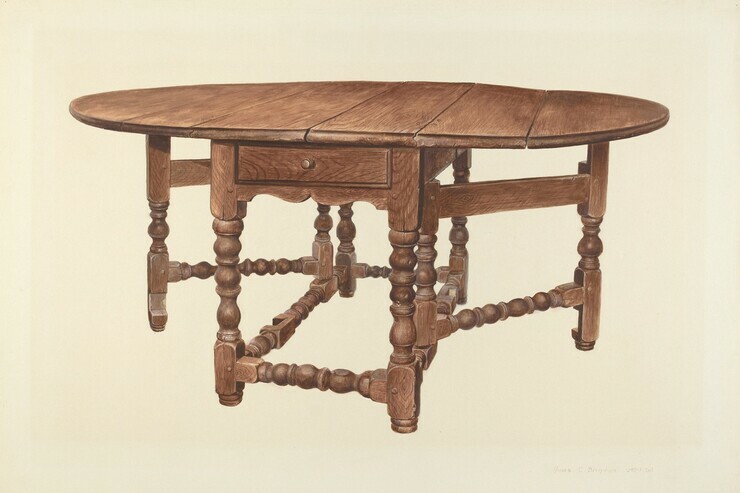 The top is scalloped and edged with molding cut from the solid wood; the molded edge gave rise to the term "piecrust table," frequently used in reference to tables such as this one. 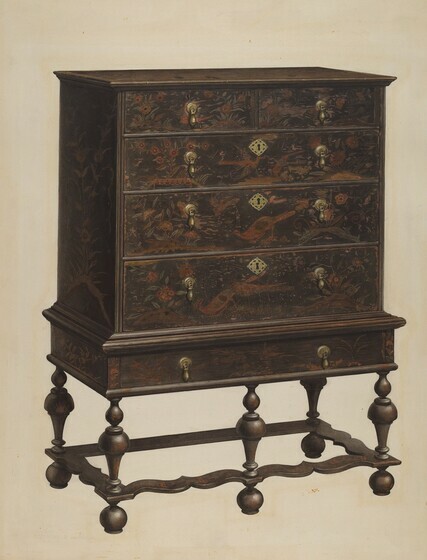 Between 1760 and 1770, American highboys became very ornate. The most elaborate pieces came from Philadelphia, which was a center of style and culture and one of the most important American cities both before and after the Revolution. 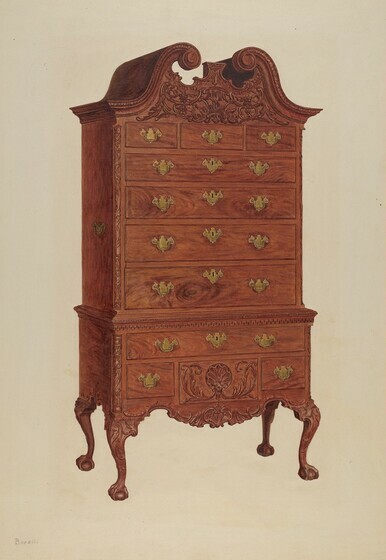 This highboy was made by William Savery, a leading cabinetmaker of Philadelphia. It has a carved scrolled bonnet top; between the scrolls is a lavishly carved design of leaves and tendrils. The quarter columns at the front corners are ornamented with vine carving. Carved designs in the acanthus motif appear on the cabriole legs, and carved shell-like forms ornament the shaped skirting. The elaborate carving, a combination of motifs based upon rhythmically intertwined curves, produces an effect of great decorative richness, characteristic of the fully developed Chippendale style as practiced by the cabinetmakers of Philadelphia. In the William and Mary period, low chests on legs were often used as supports for high chests. In eighteenth-century America, they were frequently made as separate pieces, and the term "lowboy" became part of popular terminology. This lowboy, made by William Savery, the Philadelphia cabinetmaker, is a companion piece to the highboy seen in the previous frame. Like the highboy, this piece has shaped skirting with rocaille, or shell-like, carving. The cabriole legs, ending in bold claw and ball feet, are vigorously carved at the knee in an acanthus design. The quarter columns at the front corners are ornamented with vine carvings. The top is edged with a variety of carved borders: a Greek fret design lies beneath a running band of wavelike, interlaced curves called a guilloche border. The elaborately carved middle drawer dominates the decoration and brings together both shell and foliate motifs. Large, important case pieces were featured in eighteenth-century rooms. This imposing secretary is a typical form favored in the Chippendale period. Rather than having the common ball and claw foot, it stands upon boldly carved ogee feet, that is, a form combining both convex and concave curves. The vigor of the carving is continued in the block form of the base, which is composed of alternating recessed and projecting panels cut from solid wood. The sculptural quality of the piece is further emphasized by the undulating shapes of the interior compartments and drawers, by the carved panels of the upper doors, and by the molding that outlines the sweeping curves of the bonnet. 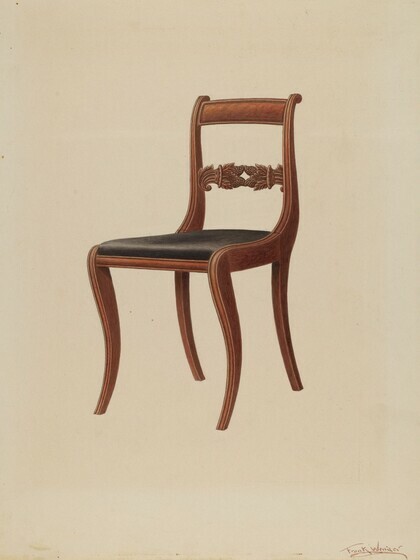 Although West Indian mahogany was the predominant wood of the Chippendale period, cherry and maple were also used. Here, the cabinetmaker has taken full advantage of the rich, warm tones of native American cherry wood. An interest in classical culture was stimulated by the discovery of the ancient Roman cities of Herculaneum in 1738 and Pompeii in 1748. Robert Adam, a Scottish architect who had visited the ancient Roman sites before he settled in England in 1762, helped change the fashion in interior decoration. Adam turned to antiquity for motifs, whereas the motifs of the earlier eighteenth century were inspired by Renaissance and baroque design. A restrained neoclassicism replaced the exuberant Chippendale forms. The Cabinet-Maker and Upholsterer's Guide, published in 1788 by the London cabinetmaker George Hepplewhite, did much to popularize the neoclassical style that Adam had introduced. This Hepplewhite shield-back chair exemplifies the style. The back is carved in a graceful design composed of classical motifs such as an urn, plumes, and drapery. The chair has slender tapering square legs ending in spade feet, typical of the Hepplewhite style. 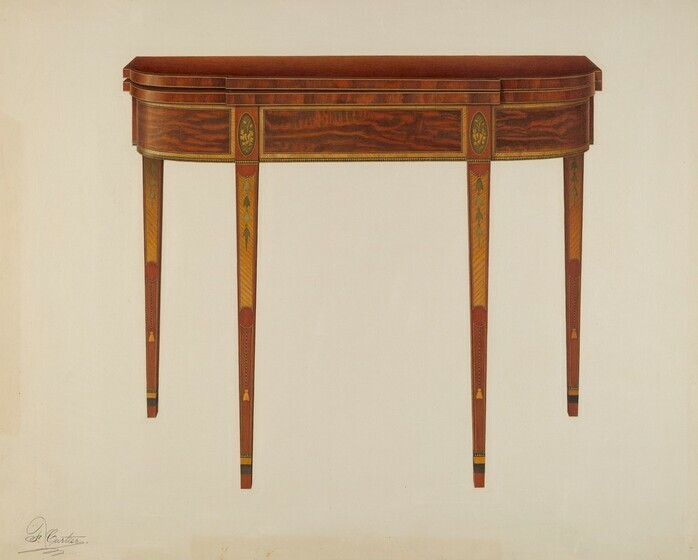 Although carved decoration appears in Hepplewhite design, most Hepplewhite furniture is ornamented with inlays of contrasting woods which emphasize the graceful, sleek lines of the form. This bow-front chest of drawers illustrates the handsome effect achieved through contrasting veneers of richly figured mahogany and satinwood. The tiers of side drawers are ornamented with finely wrought fan inlays at the corners, and each drawer is further delineated by two narrow lines of inlay, called "stringing," in contrasting wood. 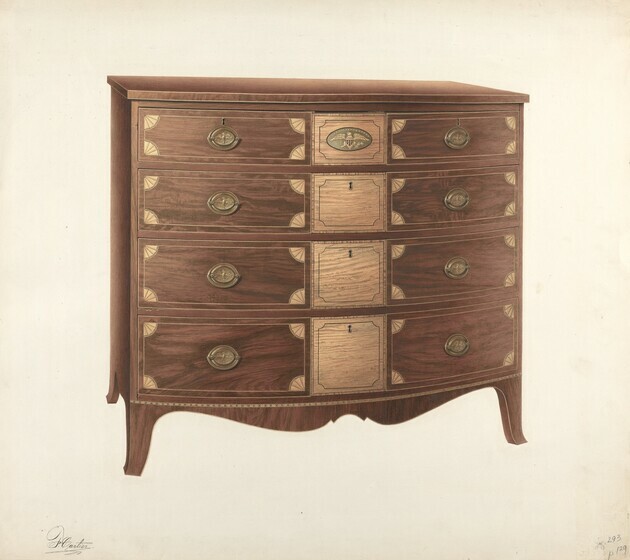 The curve of the chest front is emphasized by the light color of the central section of drawers; an inlaid oval medallion highlights the top drawer. The inlay shows the American eagle, a decorative motif favored by the patriotic citizens of the newly formed republic. 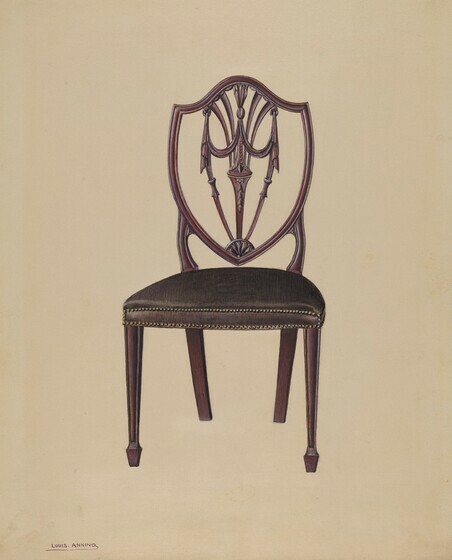 In addition to Hepplewhite's The Cabinet-Maker and Upholsterer's Guide, patterns for fashionable London furniture were available to American cabinetmakers through The Cabinet-Maker's and Upholsterer's Drawing Book, published in 1792 by Thomas Sheraton, another influential English designer. American cabinetmakers also relied upon a variety of London price books, which featured patterns in both Hepplewhite and Sheraton modes. These books formed the basis for most American furniture design of the late eighteenth century and the first part of the nineteenth century. Hepplewhite and Sheraton designs show considerable overlap in time and in a common emphasis upon graceful linear forms and elegant ornament of classical derivation. Often the term "Federal Style" is used in reference to American furniture that combines features from both Hepplewhite and Sheraton designs and that cannot be considered a pure manifestation of either style. Many card tables were made after the patterns of both Hepplewhite and Sheraton, and often these tables combine elements from both styles. This Baltimore card table, with the bellflower inlay typical of the area, has the graceful lines, rich veneers, and delicate inlays that characterize the best Hepplewhite pieces. The square top with recessed curved, or ovolu, corners was commonly featured in Sheraton forms. During the Federal period, from about 1780 to 1820, work tables became popular, and many new types were developed. Sheraton's Drawing Book offered numerous elaborate patterns for "Ladies' Work-Tables," or sewing tables, of the kind shown here. 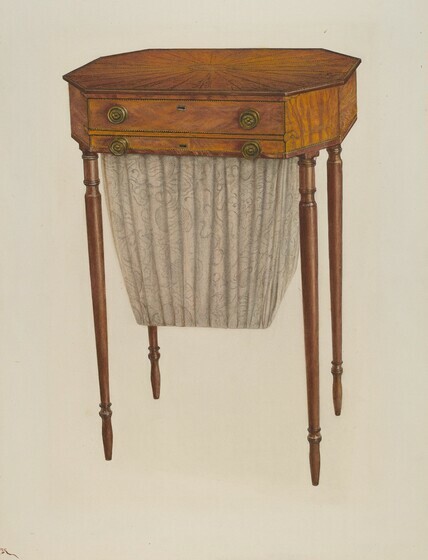 Customarily, these tables were made with two drawers; the top drawer held supplies, and the lower drawer held a suspended pouch for work in progress. As in Hepplewhite furniture, much of the elegance of this piece comes from the rich contrast of figured birch veneers, mahogany banding, and checkered stringing. Notice that unlike Hepplewhite furniture, the slim legs of this table are turned. Slender turned legs, often finely fluted or reeded, are a consistent feature of Sheraton design, as are tabletops such as this one, in which the regular square or rectangular shape is enlivened by diagonal or canted corners. While shield and heart-shaped chair backs are commonly associated with the Hepplewhite style, Sheraton chairs frequently feature a square back. Sheraton chair backs were carved in a variety of ornamental motifs including drapery swags, urns, pointed arches, colonettes, fans, and rosettes. 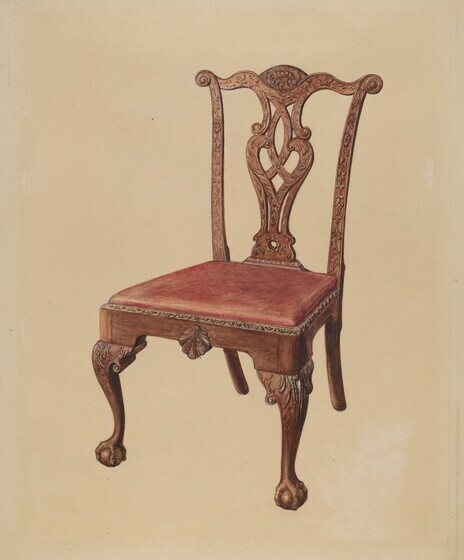 This square-back New York side chair strongly resembles a plate from the 1794 edition of Sheraton's Drawing Book but differs from the original pattern in that the central urn shape is pierced. The use of the feather motif and the tapering straight leg, frequently seen in Hepplewhite designs, demonstrates the interrelatedness of the two styles. Notice that the tapered leg is finely grooved, creating a paneled effect unlike the smooth surface of Hepplewhite forms. The carved detail of this chair is exceptionally crisp and refined and is thus very much in keeping with the clear, clean lines of the form. As an alternative to inlaid ornament, Sheraton designs customarily rely upon carved decoration. This well-proportioned mahogany sofa displays expertly carved, reeded arms that slope gracefully to join slender reeded and turned front posts. The front legs, too, are finely reeded, and a long triple panel crest rail is adorned with elegantly carved swags, bow-knots, and tassels. The sofa was made between 1810 and 1815 by Duncan Phyfe, a well-known New York cabinetmaker; it represents an early stage in his career, when he was producing furniture in the Sheraton style. The tradition of painted decoration goes back to the vogue for "Japanning" prevalent in the William and Mary and the Queen Anne periods. Sheraton "fancy furniture," with painted decoration, was exceedingly popular in the early nineteenth century. Handsomely painted settees, blending two or three chair backs into a single unit, were produced in a variety of designs for use in fashionable drawing rooms. 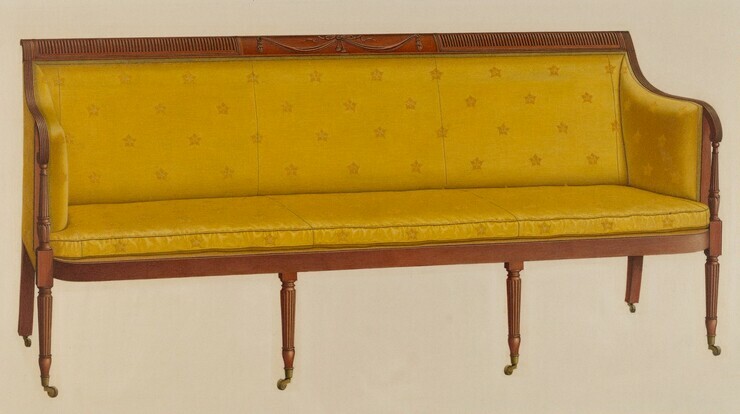 This settee, made about 1800 in New York City, features the popular Sheraton urn and floral motifs, which were favored by New York craftsmen. Dark backgrounds, such as that seen on this piece, were commonly used and were produced by applying layers of varnishes over deep brown, green, or black paint. Here, the background provides a striking contrast to the touches of light green, cream, pink, and white used to highlight the urn of flowers. Delicately painted white blossoms adorn the uprights of the seat back and of the arms and legs; they are reminiscent of the carved rosettes found on other Sheraton furniture. After about 1810, Sheraton furniture became heavier than that of earlier years and gradually developed into what is called "Regency," a style named after the regency of George IV in England. The Regency style represented a second phase of classicism and was strongly influenced by the forms of ancient furniture rather than by decorative motifs alone. 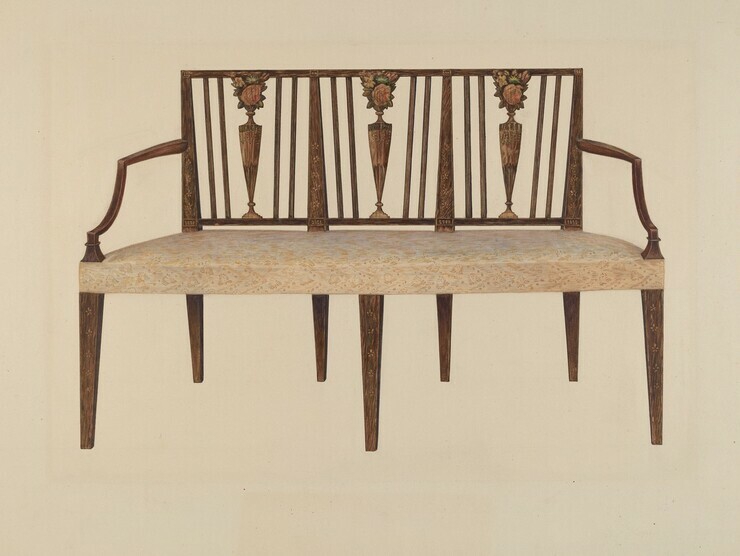 Furniture designed to reproduce ancient models was favored in America during the Regency period, which lasted through the 1820s, and reflected fashions in both England and France. 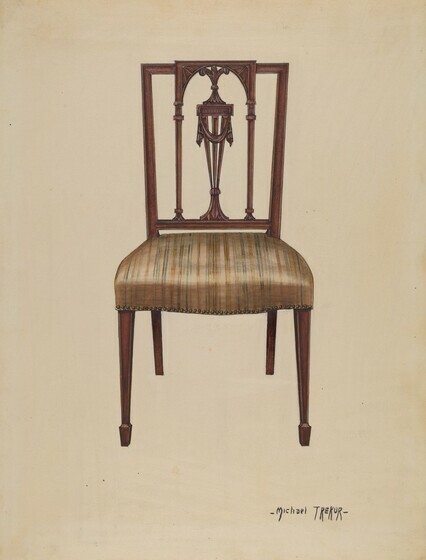 This Regency-style chair was made by Duncan Phyfe, the prolific New York cabinetmaker of the nineteenth century. It represents his second period of furniture design based upon classical models and is distinguished from his earlier work in which Sheraton's influence prevailed. The design of this chair is based on the "klismos," an ancient Greek chair form with incurved legs and with the seat rail and back in an unbroken curve. Phyfe introduced this form into American furniture design. After the 1820s, the grace and elegance of Regency furniture gave way to the heavier and bulkier forms of the American Empire style, named after its French counterpart. 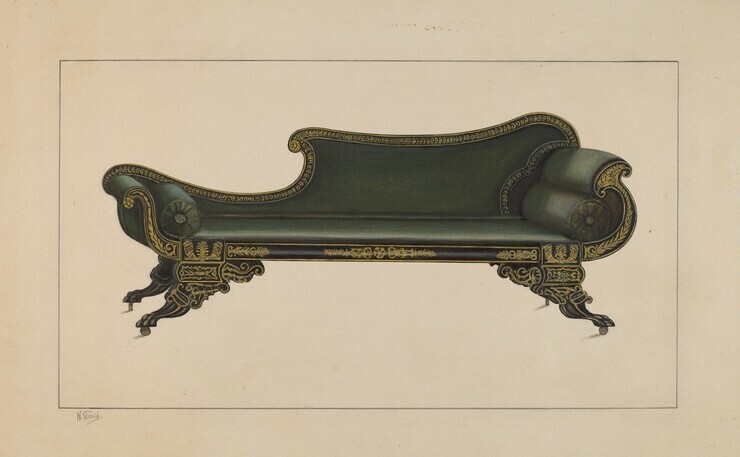 American Empire furniture continued to reflect classical prototypes, but often the features were exaggerated. In this period, one finds an abundance of thick pedestals and columns, rolled backs and arms, and animal claw or scrolled feet. Vigorous carving and richly figured woods were emphasized, but Empire furniture was also painted; often it was ornamented with decorative metal mounts and with gilt stencil patterns that reflected the metal designs. This late Empire couch dates from the mid-nineteenth century. The form is based upon classical Greek and Roman banquet couches with asymmetrical arms. The exuberance of the scrolled arms is echoed in the sweeping curves of the back. The piece is elaborately stenciled; a profusion of decorative motifs includes leafy anthemion and acanthus patterns, lyres, cornucopias, and rosettes, representing a full range of antique ornament. The decorative motifs flow into each other and reinforce the fluid curves of the form. The boldly flared animal paw feet, popular in this period, provide strong support and a vigorous counterbalance for the scrolling forms of the body. Empire furniture, extravagant in design and profusely decorated, was a popular feature of fashionable homes at a time when America's abundance held promise for all, and "peace and plenty" was a common slogan.